While mobile devices offer many innovative possibilities to help increase the standard of living for individuals with disabilities and other special needs, the process of developing assistive technology, such that it will be effective across a group of individuals with a particular disability, can be extremely challenging. 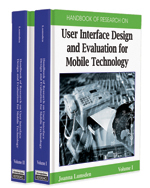 This chapter discusses key issues and trends related to designing and evaluating mobile assistive technology for individuals with disabilities. Following an overview of general design process issues, we argue (based on current research trends) that individuals with disabilities and domain experts be involved throughout the development process. While this, in itself, presents its own set of challenges, many strategies have successfully been used to overcome the difficulties and maximize the contributions of users and experts alike. Guidelines based on these strategies are discussed and are illustrated with real examples from one of our active research projects. Guidelines: A set of heuristics, typically based on practical experience, designed to guide a process or development activity. Domain Experts: Persons who, as a result of training and/or experience, possess expertise in a field for which technology is being developed. Assistive Mobile Technology: Applications running on mobile technology (such as personal digital assistants (PDAs)) that are employed to assist individuals with disabilities in terms of, for example, rehabilitation, and/or to perform daily activities affected by their disability. Evaluation Methods: Techniques used to assess (a) the technological needs of a given user community and (b) the usability and suitability of technological applications. Individuals with Disabilities: Persons with, for example, physical, cognitive, developmental, psychiatric, or learning disabilities, as well as persons with other special needs, such as the elderly (age 65+) and adults with limited literacy skills. Participatory design (PD): A design method in which technology experts, domain experts, and target users work collaboratively to design a solution.